Releasing for the First Time Ever on Blu-ray™! 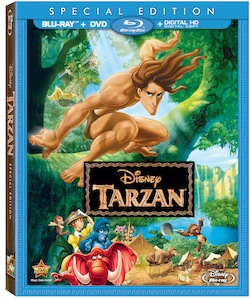 Synopsis: Disney’s legendary adventure is better than ever as “Tarzan®” bursts onto Blu-ray for the first time ever with spectacular picture and amazing sound. 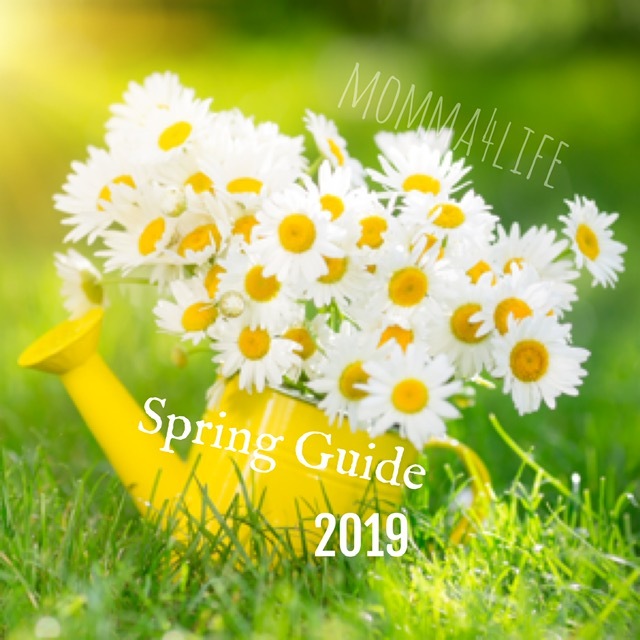 Filled with thrills, laughs and Academy Award®-winning music (Best Music, Original Song, “You’ll Be In My Heart,” 1999), this family favorite will make you go wild. Disney’s magnificent adaptation of Edgar Rice Burroughs’ story begins deep within the jungle when baby Tarzan is adopted by a family of gorillas. But his “Two Worlds” collide with the arrival of humans, forcing Tarzan to choose between a “civilized” life with the beautiful Jane and the life he shares with his fun-loving friends and his gorilla family. Enjoy this wild and wonderful adventure in a whole new way on Disney Blu-ray! TARZAN® owned by Edgar Rice Burroughs, Inc. and used with permission. 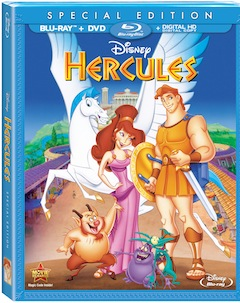 Synopsis: Experience “Hercules,” Disney’s animated classic from the creators of “Aladdin” and “The Little Mermaid,” on Blu-ray for the first time ever! Nominated for an Academy Award® (Best Music, Original Song, “Go The Distance,” 1997), this legendary family favorite is packed with colossal laughs and non-stop adventure. Taken from the gods as a newborn and adopted on earth, Hercules is just an awkward pillar of strength trying to fit in. What he wants most is to impress his father Zeus. When Hercules discovers Hades’ sinister plot to take over Mount Olympus, he goes from zero to hero and, with the help of his pals Pegasus and Phil, discovers that real strength comes from the heart! 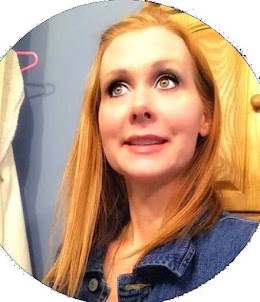 Synopsis: Let the enchantment begin! 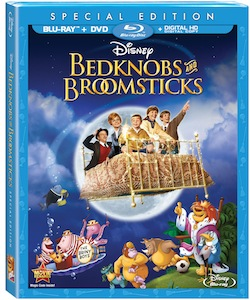 Disney’s Academy Award® winning classic, “Bedknobs and Broomsticks” (Best Visual Effects, 1971), soars onto Blu-ray for the first time with an all-new digital master. Experience a dazzling blend of live action and wondrous animation from the producer, director and writer of Mary Poppins, sure to delight the entire family. 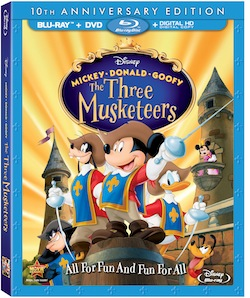 Synopsis: Celebrate the 10th anniversary of Disney’s swashbuckling adventure, “Mickey, Donald and Goofy: The Three Musketeers,” presented for the first time ever in a dazzling new Blu-ray Special Edition! Join Mickey and all your favorite Disney characters in this outrageously funny take on the timeless tale. Cast: Wayne Allwine (“Mickey's Christmas Carol,” “Prince and the Pauper”) as Mickey Mouse, Tony Anselmo (“DuckTales,” “The Prince and the Pauper”) as Donald Duck, Bill Farmer (“A Goofy Movie,” “Mickey Mouse Clubhouse”) as Goofy, Tress MacNeille (“The Simpsons,” “Hercules”) as Daisy Duck, Jim Cummings (“Winnie the Pooh,” “Chip 'n Dale Rescue Rangers”) as Pete, April Winchell (“Despicable Me 2,” “Antz”) as Clarabelle the Cow and Russi Taylor (“Mickey Mouse Clubhouse,” “Sophia the First”) as Minnie. Synopsis: Experience Walt Disney’s timeless classic, “The Adventures Of Ichabod And Mr. Toad,” on breathtaking Blu-ray for the first time ever! Disney’s humorous retelling of two unforgettable classics, The Legend Of Sleepy Hollow and The Wind In The Willows, wonderfully narrated by Basil Rathbone and Bing Crosby, come together in one magnificent adventure. First, hang on for a wild ride with the fun loving Mr. J. Thaddeus Toad. When his passion for motorcars lands him in hot water, he must rely on his faithful friends to clear his name. Then meet the infamous Ichabod Crane whose comic rivalry for the affections of the town beauty leads to a heart-pounding race with the legendary Headless Horseman. Share these high-spirited adventures with your whole family on Blu-ray and Digital HD. Cast: Bing Crosby (“Holiday Inn,” “White Christmas”) as Narrator, The Legend of Sleepy Hollow, Basil Rathbone (“The Adventures of Sherlock Holmes,” “The Hound of the Baskervilles”) as Narrator, The Wind in the Willows. Story By: “The Legend of Sleepy Hollow” based on the story by Washington Irving. “The Wind and the Willows” based on the story by Kenneth Grahame. Written By: Erdman Penner, Winston Hibler, Joe Rinaldi, Ted Sears, Homer Brightman and Harry Reeves. 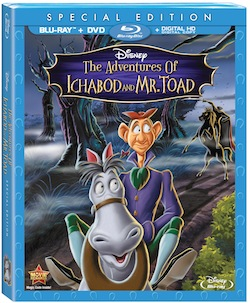 Synopsis: Experience two classic Disney masterpieces, “The Adventures Of Ichabod And Mr. Toad” and “Fun and Fancy Free” for the very first time on Blu-ray. Enjoy Disney animation’s humorous retelling of two unforgettable classics, “The Legend Of Sleepy Hollow” and “The Wind In The Willows,” wonderfully narrated by Basil Rathbone and Bing Crosby, which come together for magnificent adventures. Then have some fun with Mickey, Donald, and Goofy in “Fun and Fancy Free,” as Jiminy Cricket brings to life the timeless tales of Bongo and Mickey and the Beanstalk. This was the last animated feature starring Walt Disney as the voice of Mickey Mouse and the only film featuring all four of Disney’s most famous characters. These classic films follow Disney’s tradition of combining great storytelling, unforgettable characters, music and adventure to create fun you can share with the whole family. Includes Disney bonus classic, “The Reluctant Dragon” – only on Blu-ray! Voice Cast: Edgar Bergen (“The Jack Benny Program,” “The Muppet Movie”) as Himself, Dinah Shore (“Make Mine Music,” “The Dinah Shore Chevy Show”) as Herself, Walt Disney and Jimmy Macdonald as Mickey Mouse, and Cliff Edwards (“Pinnocchio,” “Playhouse 90”) as Jiminy Cricket.